The calm-looking single parent uses boda bodas not out of choice, but rather due to lack of it—choice. Yet it is that same means of transport that once piled more misery in her life with her physical disability, especially in a society where the disabled are highly discriminated by many. Nakalongo now has to look after a child she had never planned for, and whose father she does not know nor can ever trace. All she knows is her daughter’s father, a motorcyclist then, raped and abandoned her on one such an agonizing day a little over a year ago. Nine months later, she would find herself inside the maternity ward at Nakavule hospital in Iganga district, ready to bring another life into her harsh world. Despite the painful reminder of the dark events that led to her accidental pregnancy, Nakalongo says she loves her daughter. She still admits that despite born with physical deformity, life was not as hard before as it is now with a baby she had not planned for. In her quest for a better life, Nakalongo turned up at New Vision head offices in Kampala seeking financial support to buy a mattress, bed-sheets and other necessities for boarding school. She has been offered a place at an institute in Nkokonjeru where she will be trained in hair-dressing for about six months. “This will help me become self-reliant as I can attend to my customers at home,” she says, with a sense of hope dominant in her voice. Nakalongo’s father died while she was in Primary Two [elementary school] followed by her mum two years later. Before the demise of her mother, she stayed at Bukeka village in Bugerere. Consequently, she dropped out of school with no more support left for her. Fortunately, it did not take long until a concerned resident in the area contacted the late Mayor for Lugazi, Haji Said Mubarak who offered to sponsor her further education. 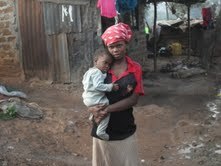 With no more support, she stayed with her grandmother, Annet Nakonde in Lugazi. Her life suddenly took a harsh twist one-and-a-half years ago when a boda boda man riding her home turned against her along the way and raped her, leaving her pregnant. Along the way, the rider turned into an isolated area, dragged her off the bike and went down on her. She gave birth to her daughter at Nakavule hospital in the eastern Ugandan district of Iganga. Nakalongo admits that she would not identify her daughter’s father if they were to cross paths anywhere. He remains a shadow in her life, but she basks in the hope that her training at the institute in Nkokonjeru will be a source of a brighter side for her and her daughter’s lives.